Gordon is one of the long standing members of Eastwood Writers. He is married and until recently was the Group Treasurer. Standing down to concentrate on his other busy activities. 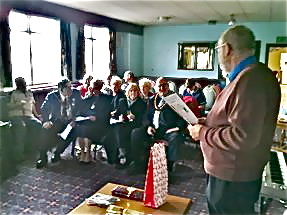 one of them being an active member of The British Lung Foundation's 'Breathe Easy' Nottingham Group. he regularly broadcasts interesting and original items on Radio Nottingham. He is pictured here during a performance of Lyrical Allsorts at Durban House this summer during the Eastwood Arts Festival. reading from his own short story.